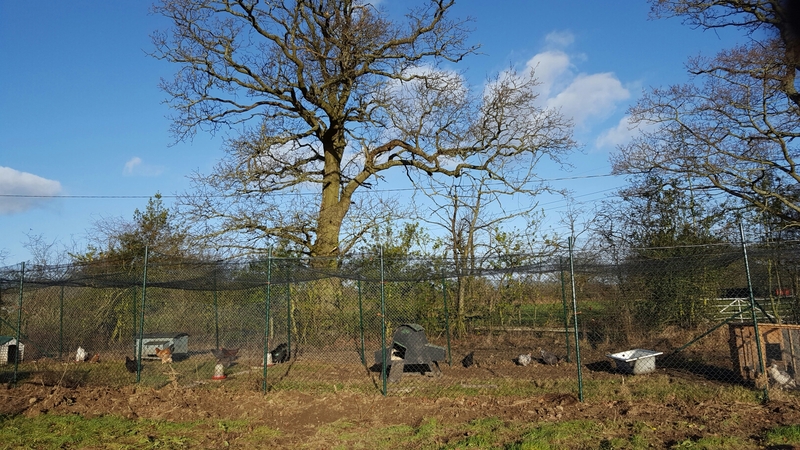 The enclosure was actually finished (part finished with birds installed) weeks ago but I’ve been lapse in updating the blog…. The holes for the 4m x 3m pond and sunken bath were filled in; I decided against both for various reasons. 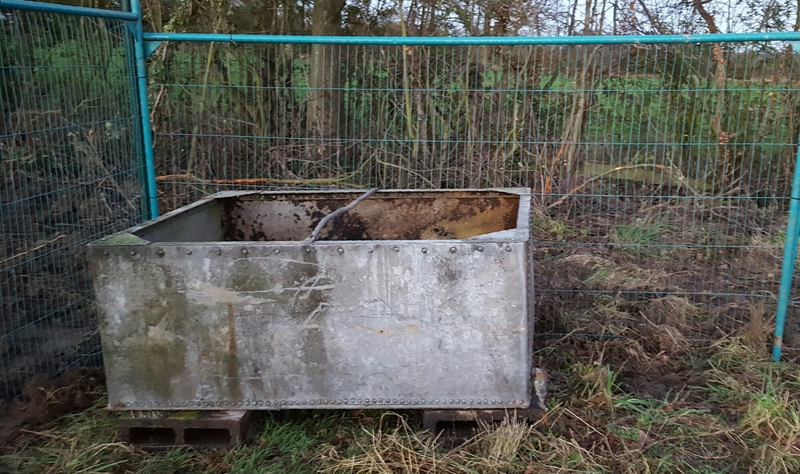 The old water tank that was down by the old corrugated shelter (above) was brought up and into the top end of the enclosure and put on bricks. Food will be stored here once I’ve added a rodent proof and waterproof lid. Arguably the biggest job was the back filling of the trench. You can see the digger (mini excavator) working at the far end. 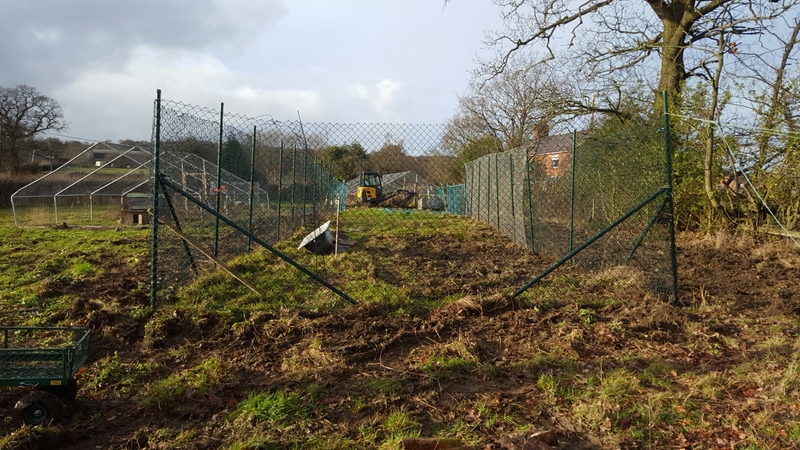 Once the digger had finished its work a length of tension wire was fitted to the top of the 21m long chainlink section. I used 100m of nylon rope to criss cross from pole to pole to provide support to the massive 10year guaranteed, heavy duty nylon bird net that is over 32m long (to ultimately go over the security panel section too when completed) by 6.5m (including overlap). The net is cable tied all the way round so there are no holes. Internal partitions were made of chicken wire to make 3 sections and then the birds’ houses and the birds themselves were added. 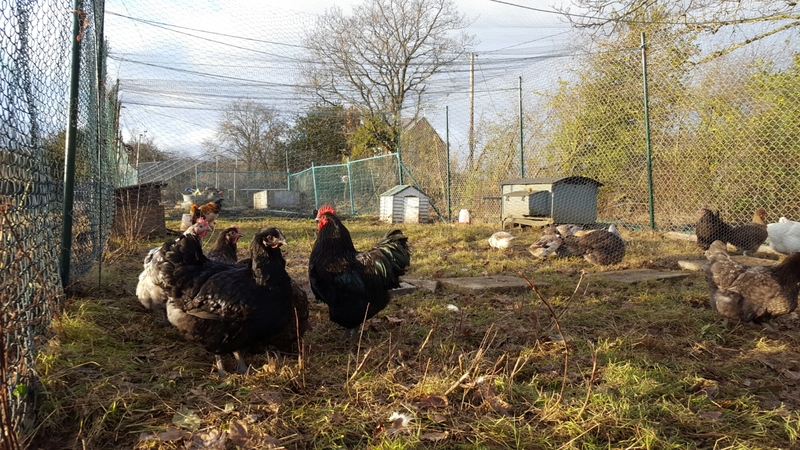 L to R – 6 Welsh Harlequin ducks, 4 pet hens (Irene, Peggy, Meggy and the Dorking) and the 3 new younger pet hens (Asia, Santana and Matty); Henry and his 5 Jersey Giant girls; the 3 peafowl. Round the base thick aviary mesh was added, dug into the ground, to deter rodents. If money had been no option the chainlink and outer layer of aviary mesh would have been concreted in at least 18″ not just a foot down, aviary mesh too… and the whole enclosure would have been chainlink not had to be extended by the security panels at one end… and it would have been finished February/March not November/December!! As it is only the 21m chainlink section is finished and populated with birds. 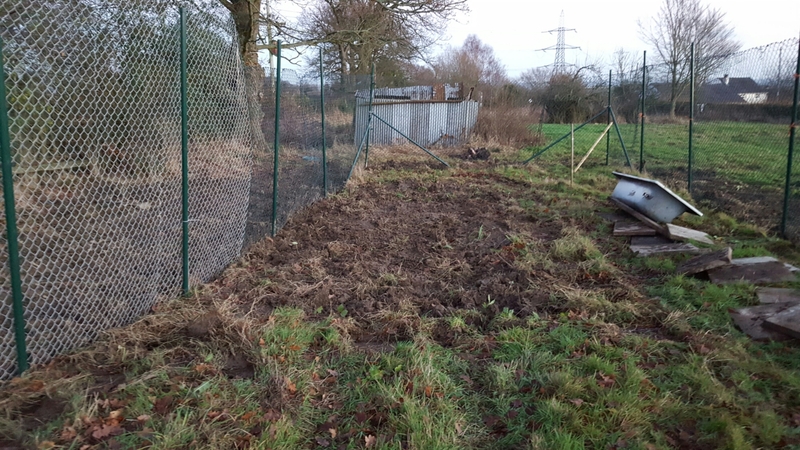 The 10.5m long section of security panels still needs to be done – hopefully by the end of February for the geese to be in during their breeding season – but am busy with so many other jobs at the moment alongside my actual full-time day job! 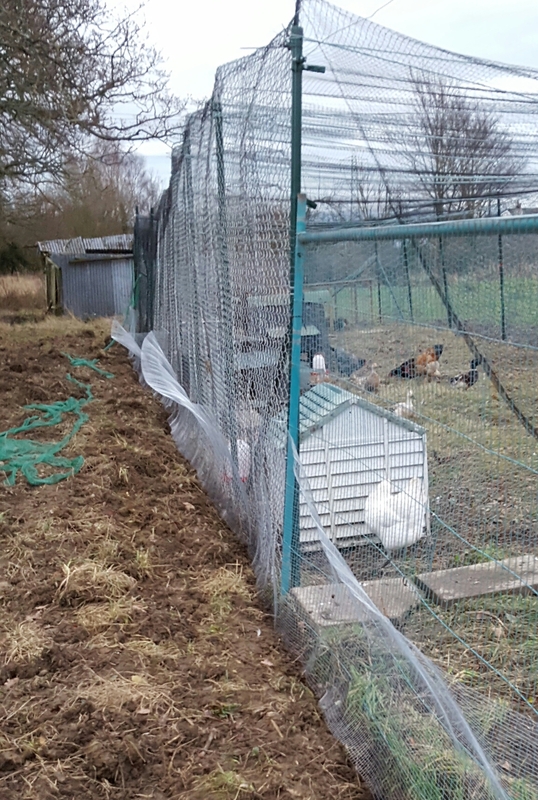 Happy birds, loving their new home. « Chainlink enclosure progress – Mud City! !